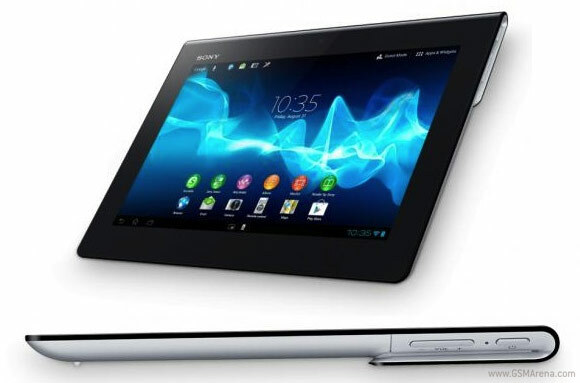 The Xperia S Tablet is the first tablet that names as Sony Xperia device. It reminds the new Xperia S Tablet at first glance something of the wedge-shaped Tablet S predecessor, which it shares the unusual screen size of 9.4 inches. What is new is especially potent hardware and splash protection. But as the Android tablet hits in practice? When Android operating system Sony is no longer on Honeycomb, but on Ice Cream Sandwich (Android 4.0.3). There is currently no information on when to expect an update to Jelly Bean (Android 4.1 or 4.2) is. Compared with Honeycomb Ice Cream Sandwich is also a significant improvement that represents Sony's access to services such as PlayStation and Mobile Music Unlimited allows is obvious. The Tegra 2 SoC, the Tablet S is replaced by the more powerful Tegra 3 SoC. This SoC is used in many current Android tablets, and should also pay the Xperia tablet for a good performance. The SoC has access to 1 GB of memory. Data can be depending on the model to 16, drop 32 or 64 GB of flash memory. For memory expansion there, unlike many competitors, no microSD card slot, but a regular SD card slot. Several different variants of it not only in terms of the memory size, but also with regard to wireless connectivity. In addition to regular wireless model, a 3G variant for mobile Internet service. At 9.4 inches wide screen Sony has a resolution of 1280 x 800 pixels. The trend to realize ever more tablet resolutions, the Japanese company does not so far with. Other facilities Xperia Tablet S shall include a rear 8 MP camera and an infrared transceiver. Therefore, the tablet can also replace remote controls. A particular feature of the Xperia S tablet should finally be mentioned: The display is splash proof. However, just saw the splash guard for negative headlines . Manufacturing problems should have meant that water could enter through gaps between the display and housing. Sony temporarily stopped selling the tablets and promised to replace affected units. Meanwhile, the problems but stopped and should not occur in actual devices. Currently, the Sony Tablet from 397 euro to be acquired. But that is the price of the wireless version with 16 GB. The model with 3G and 16 GB will cost at least 487 euros. " The best equipment, so 3G and 64 GB of memory facilitates the wallet as much as 720 euros.